Make sure you are logged into Windows as an Administrator or have your computer's administrator account password to hand in order to install the software. * If "64-bit Operating System" is listed next to System type, you’re running 64-bit Windows7. * If "32-bit Operating System" is listed next to System type, you’re running 32-bit Windows7. 1. Download One Dialer App - 32 or 64 bit depending on your Windows 7 "bits"
If you are using Internet Explorer click Run. If prompted confirm any User Account Control and security warnings. In IE9/IE10/IE11 to do this you may need to click Actions then Run anyway. If you are using Firefox click Save and then either click the green download arrow and click on the downloaded file to run it or go to your Downloads folder and double click the downloaded file. If prompted confirm any User Account Control and security warnings. If you are using Google Chrome click on the downloaded file to the bottom left. If prompted confirm any User Account Control and security warnings. 2. Go through installation steps, and tick the box "Add a shortcut on the desktop"
3. 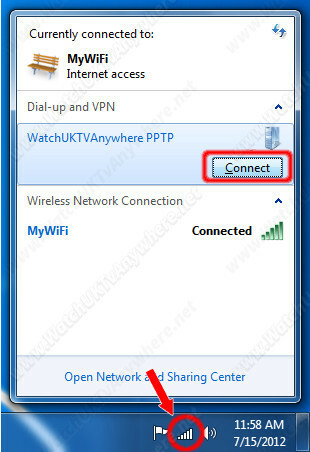 Enter your VPN-Username and VPN-Password as shown in the yellow box below. Tick "Save password" check-box. And if you have entered account correctly, you will be able to connect to the VPN. Click on the appropriate network icon in the systray (system tray, lower right corner of the screen) to open up the Network Connections. If you have an Ethernet connection (LAN) on you computer, your network icon looks like a monitor with a network cable. If you have a wireless adapter (WiFi) it will display as a wireless signal strength icon. 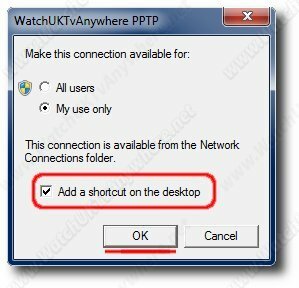 Locate the WatchUKTvAnywhere PPTP connection and click on it to reveal the "Connect" or "Disconnect" button - depending on current status.